So here’s my question…can you combine a grungy, mixed media sort of look with sequins? I like it…but then I’m totally into the sequin craze these days. Lots of layers here even though you only see two. 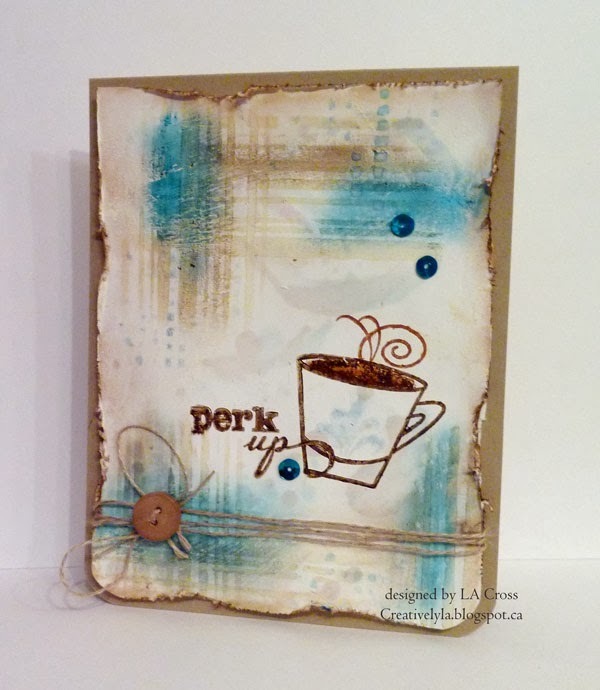 The background was made with a couple of shades of Distress Inks and a stencil. Next came a layer of gesso, followed by more ink and another couple of stencils. Then some Gelatos were rubbed on with my finger and finally another layer of stenciling and ink. A wee bit of acrylic was smudged on with my trusty finger too! The coffee cup and sentiment were stamped and then I added some Distress Stickles to the interior of the cup. Wrapped some twine around the bottom of the card and finished it off with a button…then I just had to add some sequins…could not help myself…is there a sequins anonymous group anywhere out there???? The inside says “it’s your birthday”. The edges were distressed and inked, it was popped up on dimensionals on my card base and done! Just gorgeous! Love those grungy layers! Love the background Lee-Anne! I think you've done a great job of combining the mixed media, grunge & trendy sequins!! grungy and sequins…it rocks. I love your use of that Verve set…looks fabulous. Gad, Lee-Anne, I could spend all day here! I should follow you around and watch!! LOLOL This is so warm, fun, and wonderful! What a fabulous card. Love the stenciled background. The colors look awesome. Thank you for playing along with us at the Curtain Call Inspiration Challenge.